I’ve got one of those horizontal Crapsman ones. I always thought it got smokin’ hot. Going outside to see which model number I have. Mine’s not included. Still think it runs hot. Eh well. So in addition to these things ruining your hearing and testing your sanity with their dB level, they will also burn your house down? Heat and compressing air go hand-in-hand…. Manufacturing defects aside, we sure love to badmouth those little oil-less compressors, don’t we? They have their uses and they’re little marvels in their own right but our mistake is expecting too much from them; I would never compare it to the 5hp two stage DeVilbiss behind the shop or my small engine driven model. I have a little oil-less compressor that’s hot, noisy, and on a per-standard cubic foot basis the most expensive way I have to compress air but on the other hand the buy-in price is pretty low, needs no oil and therefor puts no oil into the air it compresses, and can be lugged into homes while my engine driven one roars away at the curb. By the way: If you buy a small oil-less compressor read the manual; they often have run-in procedures that are very important to follow. This would have been nice to know three years ago when my Husky (the EXACT one in the picture) decided to burn up it’s motor after a couple years of minimal homeowner level usage. A short in the motor melted the windings, some plastic and produced a LOT of smoke. Had I gone in the house while it refilled (often the case because of how loud it was) it could have easily started a fire. Yeah, basically I guess that’s what I’m doing. I’ve got a 80 gal DeVilbiss in the garage waiting until I get 240 power out there, and a two stage V-4 Emglo that’s engine driven, that realistically is only for giant jobs. The day in day out stuff is made for the oilless like filling up a lawn mower tire. It’s easy to rail on it because it takes forever to recharge, but truthfully its always there with the flip of a switch. …..waiting for 240 service to the garage though. I have a recalled Husky. The main problem with the recall is that these things aren’t something you can just toss in a box and mail in. The nearest repair center is about an hour drive, and they’re not open late or on weekends. How the hell am I supposed to get it to them? I have the stand up compressor but I can’t seem to get the repair kit as promised. What I have now is a large useless metal tank taking up space in my garage. Have become very unhappy with Sears! I have been trying for several months to get the replacemet part.I have talked to 15 different customer service agents.Two have promise to send the part within 5 to 8 business days.I will fill out the BBB form and let them answer it.Sears will be closed by Feb 2016.They have gone down hill.Don’t shop there.I found the air filter and sparkplug for my sears craftsman lawnmower at Menards.Screw Sears. 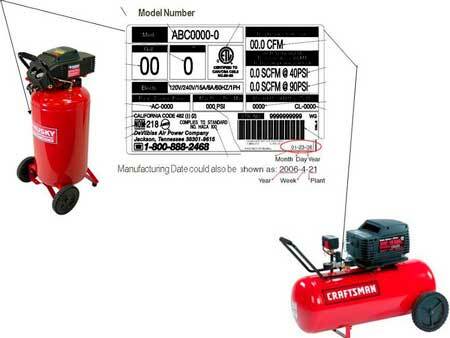 My Sears compressor was not in the recall by model number, identical to the one shown in the recall pictures was manufactured in 1996, CAUGHT FIRE AND BURNED DOWN A 5000SF industrial warehouse with over $300,000 of contents.